Police questioned three people over the deadly bombing of Benazir Bhutto's caravan, which killed at least 136 people and shattered what was intended to be a triumphant return from exile. The men were linked to a vehicle that police believe was used by one of the attackers who threw a grenade at the convoy late Thursday, causing Bhutto's campaign bus to come to a halt, said a senior investigator who spoke on condition of anonymity Saturday because of the sensitivity of the investigation. Seconds later, a suicide bomber blew himself up with a shrapnel-filled explosive. Police detained the three men in southern Punjab province - a center for militancy - and took them to Karachi for questioning. The senior investigator said police believed the men, who have yet to be charged, hold crucial clues to the bombing. 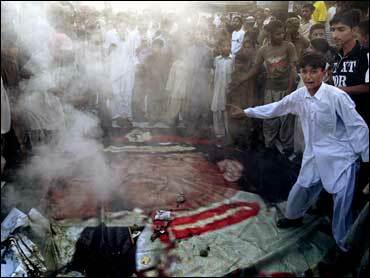 The attack was the deadliest in Pakistan's history, turning Bhutto's jubilant homecoming parade into a scene of carnage. More than 200 were injured. Pakistan's government on Saturday denied involvement in the attack while sporadic violence flared in Karachi, a boisterous city of 15 million people. Angry over the suicide bombing, supporters of her Pakistan People's Party threw stones and burned tires in parts of the city. Fourteen people were shot in a neighborhood that is one of her strongholds after outsiders mixed with Bhutto supporters. Police said the outsiders began firing shots. "They (Bhutto supporters) are expressing their anguish over the attack on their leader and the deaths of so many people," said Fayaz Khan, a senior Karachi police officer. Authorities say the bombing bore the hallmarks of a warlord and the al Qaeda terror network. Bhutto blamed al Qaeda and Taliban militants for the assassination attempt against her, but also hinted that government or military officials could have been involved. "I think we should stop playing blame games. The government provided the best possible security to her," Deputy Information Minister Tariq Azim told The Associated Press on Saturday. The list of people who could have targeted the pro-Western leader is long. Bhutto blamed remnants of the regime of former military leader Gen. Zia ul-Haq allegedly complicit in her father's execution. Islamic extremists could also be bent on stopping a female political leader from modernizing Pakistan. Pakistan's Prime Minister Shaukat Aziz said the attack was unlikely to delay elections slated for January, but that the government would be alert for future attacks. "I don't see the electoral process being hindered ... but of course we will have to be wise. We'll perhaps have to change our tactics a little," he said Saturday. On Sunday, the independent newspaper The Nation called on officials to allow the vote to proceed on time. "Politicians in the ruling alliance who are not sure of winning their seats have tried to use the Karachi bombing as an excuse to put off the elections," it said in an editorial.